It is no secret that your guests are expecting world-class Wi-Fi access when they arrive at your property. We believe that your properties Wi-Fi is more than just an important guest amenity; it’s a tool for you to help gain insights into your guests. We may be biased, but we believe that Wi-Fi analytics allow you the visibility and confidence to best understand and serve your guests. Think of the power that this knowledge provides your team to do their job to the highest standard. How many guests are connecting to your Wi-Fi network. Understanding how many individuals are connecting to your network helps you to understand the operations within and around your property without you even being there. Perhaps you have neighbors enjoying your Wi-Fi network, impacting your guest’s experience. Or perhaps there is a spike in usage indicating that more guests are in that space then perhaps you knew about. This information allows you to make decisions and allows us to make recommendations on how to provide your guests with the best Wi-Fi experience. When are your guests most often connecting to the Wi-Fi. Understanding your guest’s general movement patterns allows you to better serve their needs. If peak usage falls in the afternoon or evenings, perhaps consider engaging a marketing firm to send your guests offers of area attractions. If usage increases late at night, are you prepared for the guest support calls or do you have an organization like us in place to field those calls? How many email addresses have you collected (and what are they). Asking guests to provide their email address to grant them Wi-Fi access is commonplace in nearly all industries! Enabling Wi-Fi access by providing guest email addresses provides you with a new avenue to connect with your guests; and not just the booker, everyone who visits the site and gains access to the Wi-Fi. Imagine the email marketing campaigns you can do and the business that you can grow if you just had the contact information. Average upload and download speeds. The race for the highest speed is a frenzy among articles and competing Internet providers. But what does it really mean? And do guests really care? Providing fair service is important. Ensuring that you do not have someone on Netflix hogging the bandwidth is important. But does everyone really need 100million GB of data throughput? Understanding the average upload and download speeds that your guests actually use ensures that you are always prepared with the appropriate Internet speeds and not overspending where not necessary. How often your guests are seeking support help. We highly recommend that you engage in our support services. This ensures that your guests have a toll free number to call any time 24/7/365 and you no longer need to service those late night phone calls from users who struggle with connecting. Our Dashboard shows you exactly how many individuals are calling so you can monitor the general savviness of your guests. Managing all your properties from one centralized Dashboard ensures that you have visibility into multiple locations from one place. Who has time to remember multiple logins or cross compare data from multiple places? Sure, we’re a little biased, but just a quick glance at our Dashboard helps you to understand more about your properties. Maybe a properties technology needs maintenance, or perhaps there is a spike in users (hello party guests). Regardless, having one place to access your data is important so you aren’t wasting precious time trying chasing information. Using the Wi-Fi to enhance other analytics. Interested in boosting traffic to your website or social media? Need to gain a little intel using a survey? Want to get the terms and conditions in front of your guests again? These are commonplace practices in many industries, including traditional hospitality, and are all features with our Wi-Fi gateway. Displaying your terms and conditions on the Wi-Fi access screen ensures that your guests are aware of your property rules and policies. Using a 3rd party survey company to ask guests a few questions in order to gain Wi-Fi access boosts your knowledge base and provides you with data that you may not have had access to previously. Then once authenticated to the Wi-Fi, pushing guests to your social media or website reiterates brand recognitions which helps with rebooking and increases your web analytics. All of these things provide you with new found insights into your guests, giving you a better handle on how to serve them best. We provide all of this information 24/7/365 with a real-time up-to-date Dashboard. Not only that, our management services ensure that your team has access to help in slicing and dicing this data to identify trends and interesting information about your guests. We have been experts in this field for more than twenty years and know how to provide you the most value with your Wi-Fi analytics. We are your one-stop Wi-Fi shop. *Oh hey! 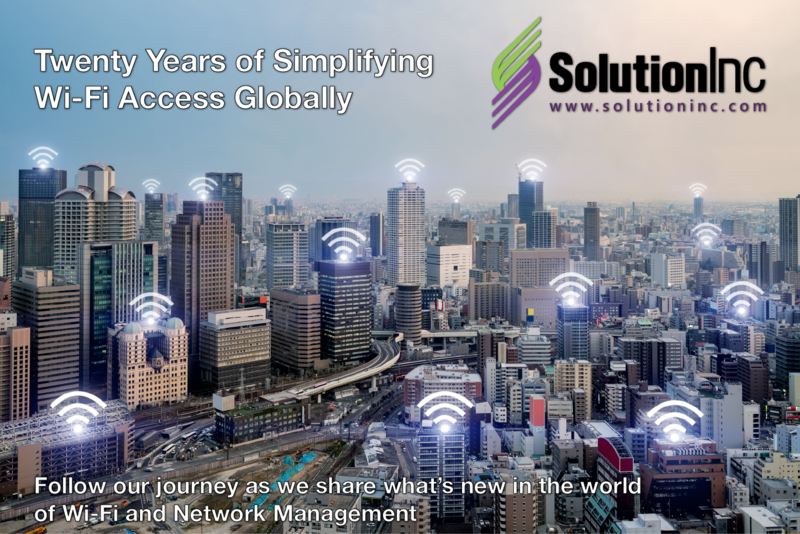 If you’re looking to learn more about our Wi-Fi offering, join us at VRMA Spring next week! We’ll be enjoying Charlotte, NC from their excellent conference centre!